Even though TECHNICALLY I’m defined as an “empty nester” because my son is on his own, married, and no longer resides at Casa de Enchanted Seashells, I don’t believe he’s ever further away than my heart. Not ALL is perpetually enchanted in the life of Princess Rosebud; It’s still difficult to think about or talk about my son’s recent emergency life-saving surgery — I can’t even GO there to that place of “what if” — BUT the worst diid NOT occur and he’s making a full recovery. He had an obstruction due to a congenital defect we never knew he had, Meckel’s diverticulum. During his surgery, 24 inches of small intestines were removed because they were necrotic, along with 8 inches of ascending colon, his appendix, and lots of other small valves and little parts. It all came about with no warning. Crazy, right? Here’s that “if” again. IF my DIL had not fought the ER and been his best assertive advocate to insist they take a more proactive approach to diagnosis his pain (she just would NOT GIVE UP) and IF we had not had such an amazing surgical team led by Dr. Todd Stafford – well, let’s just say that we are all very grateful that he had such a dedicated team of doctors. Nuff said. He lost about twenty pounds during his ordeal, and at six feet and 160 pounds on a GOOD day, that much weight loss made this normally fit and healthy young man look emaciated. During his post-surgical recovery, his diet was limited to low fiber and low residue foods; a lot of Cream of Wheat, mashed potatoes, and chicken noodle soup. No vegetables, no fruit, nothing that would interfere with the healing of multiple incisions and re-joining of internal organs. I’m happy to report that three months after the surgery, he’s defied the odds and is back to eating pretty much everything he wants, with only minor digestive upsets. He went back to work, teaching a summer course at Yale, and I’ve been sending him healthy cookies and high protein bars on a weekly basis — and as requested, he’ll receive the lentil cookies on Wednesday, and that should keep him supplied until he’s here next week for a short visit. Yay! You can be sure that I’ll be cooking and baking nonstop. I’m so HAPPY to have my Angel Boy here, surfing with tugboat man and best of all, close enough to touch and hug and play Scrabble and Bananagrams. Every minute of every day, I’m grateful to be one of the luckiest moms in the world. That Dreaded Call at 3: a.m.
A while back, I posted Alton Brown’s Lentil Cookie recipe that I discovered on Food Network’s website. This time, I experimented and created a version that’s a bit more intensely nutritious. They are quite dense, full of protein and energy, and would make a great snack for hiking. 1 cup dried fruit, I used a mixture of blueberries, strawberries, cherries, cranberries, raisins, apricots. In a medium bowl, combine egg, oil, vanilla, yogurt, brown sugar. Whisk briefly to incorporate. Add peanut butter and lentil puree and mix thoroughly. In a large bowl, combine the flour, oats, protein powder, ground flaxseed, baking powder, salt, cinnamon and allspice. Add the flour mixture. Use a wooden spoon or a hand mixer to combine. use hands to mix. Stir in dried fruit. If it seems a little dry, add yogurt. Form the dough into balls about 2 teaspoons in size and place on a baking sheet with parchment paper Bake for 13 to 17 minutes, depending on your oven’s personality. In a small pot over medium heat, combine the lentils and the water. Bring to a simmer, cover, and simmer for 30 to 40 minutes, or until lentils are tender. Remove from the heat and puree. If using immediately, let cool. This entry was posted in All Posts, Being a Mom and Grandma, Health and Beauty, My Enchanted Life, Recipes & Food, Mostly Vegan and tagged Alton Brown, baking, Banagrams, Dr. Todd Stafford, Emergency surgery, empty nest, Food Network, Intestinal obstruction, Lentil Cookie Recipe, lentil cookies, Meckel"s Diverticulum, Scrabble, surgery, Yale, Yale professor by Enchanted Seashells by Princess Rosebud. Bookmark the permalink. Wow! What a scary experience. I’m glad your son is doing well now! Thank you for sharing your recipe. I’m definitely going to make them for our kiddos! Maybe don’t tell them the “lento” part if that would scare them off! Truly, they don’t taste like lentils. And with kids, it’s a fun activity to have them help roll into balls and then flatten. You could always roll in coconut flakes or even sprinkles before baking. Not that I like the added sugar, but sometimes it’s OK.
Well, I think almost every mum thinks and behaves the same way as you! Well, I would hope so! I’m glad to have brought a smile to you! Truly, the cookies are delish. Just ignore the lentil part, you can’t really taste them at all. Our children will always be ours no matter how old they are. Glad that your is on the way to recovery. Thank you so much, it was touch and go a few times, but if he’s surfing and eating, he’s OK! Looks delish!! I remember reading about the ordeal! Thank goodness everyone worked fast! Ugh, my mother’s heart skipped a few beats there, feeling only 1/1000 of what it must’ve been like. On another note – – what was up with those Lentil cupcakes we had in our room? Did you try those? Your cookies seem very healthy!! Thanks! No, I never got a cupcake; I don’t think I knew about 1/2 the stuff that everyone knew about. Maybe cos I don’t have a smartphone? My cookies really are yummy and you can’t taste “lentil” at all. I think it’s a great way to get healthy stuff into kids of all ages. I never want to go through that again — flying all the way across the country not knowing IF he would be OK or not. Although lucky enough we had wifi all the way there and was in contact with DIL every minute. Thank goodness for technology. Hey, making these tonight for my daughter’s camp homecoming!! Just don’t make the same mistake I did and over bake them or they’ll be too dry! Thank you! Darn, I keep forgetting about WLC! So much to keep up with on social media! I might try a batch for my daughter’s 3rd grade class. How many cookies does it yield? That depends on the size of the cookie. I made mine kind of small because I mailed them and it made at least 3 dozen. Don’t bake too long or they become dry! I’m definitely saving this recipe. These sound fantastic. And there’s nothing wrong with sending cookies to our kids whatever their age! I can’t disagree with you LOL. I think he’s gained 5 pounds since we picked him up the airport! Bless his heart, but hey, he’s on the mend! How terrible for all of you. 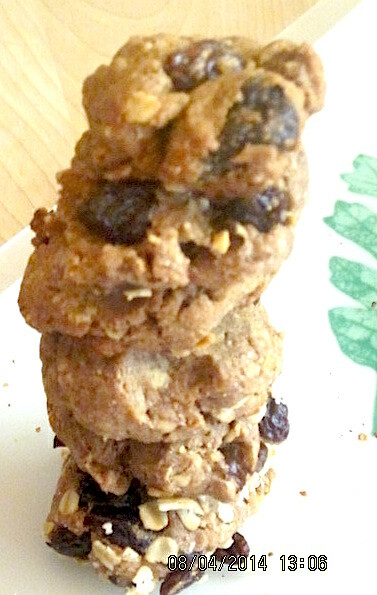 I love lentils, but NEVER thought of putting them in cookies…you never cease to amaze me,R! DO try the cookies, you can’t taste anything at all “lentil-y” – just make sure they aren’t too dry like mine were!